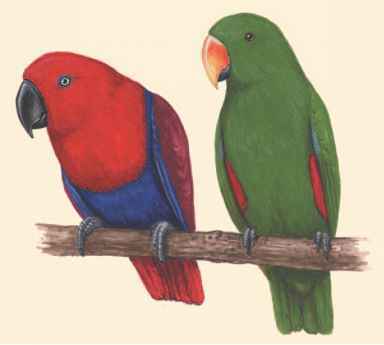 Physical characteristics: Cuban todies are brilliantly colored, primarily green in body color, with a big head, no neck, and the smallest bill of all todies. They have rosy pink sides, whitish stomach, yellow undertail coverts (feathers between flight feathers of the wing and tail), red throat, and sky-blue cheek patch. The flattened bills have notched edges and a yellow base. Their eyebrows are an almost brilliant yellow-green. They have a wingspan of about 4.3 inches (10.8 centimeters) in length, with a weight of between 0.21 and 0.23 ounces (6.0 and 6.5 grams). Geographic range: Cuban todies range throughout Cuba, including the Isle of Pines (Isle of Youth) and four large cays (KEYS or KAYS; low islands or reefs) off of Cuba's north coast. Habitat: Cuban todies are found in dry lowlands, dry mountainous scrublands, tropical deciduous forests, tropical lowland evergreen forests, mountainous evergreen forests, pine forests, and along seashores (near coastal vegetation). Specifically, they are found in shady areas, usually along streams and rivers. Diet: Cuban todies eat mostly small adult and larval insects, but have been known to eat caterpillars, spiders, and small lizards. They sometimes (but rarely) eat small fruits. Behavior and reproduction: Cuban todies are rather inactive birds that search for prey from a perch. They forage, search for food, in arid scrub at an average height above the ground of 9 feet (2.7 meters). They often look for food from twigs and undersides of leaves. They make a characteristic rattling with their wings. When perched, they sometimes repeat a peculiar short "tot-tot-tot-tot" sound. Their most characteristic call is a soft "pprreeeee-pprreeeee." Cuban todies pair for life, and have striking courtship patterns, including showing their bright pink sides. They breed from April to June, first digging burrows in earthen banks, within rotten logs, and in natural limestone cavities. Tunnels are usually about 1 foot (0.3 meters) in length, with a chamber at the end. The walls of the tunnel and the egg chamber are often lined with a thick glue-like substance mixed with algae (AL-jee), grass, lichens (LIE-kenz), small feathers, and other materials. Though infrequent, they also build at cave entrances. The white eggs produced by the female, usually three to four in number, are the smallest of the todies. Cuban todies and people: People in poor areas sometimes eat Cuban todies. Otherwise, they are a delight to people who enjoy watching them. Elphick, Chris, John B. Dunning Jr., and David Allen Sibley, eds. The Sibley Guide to Bird Life and Behavior. New York: Alfred A. Knopf, 2001.